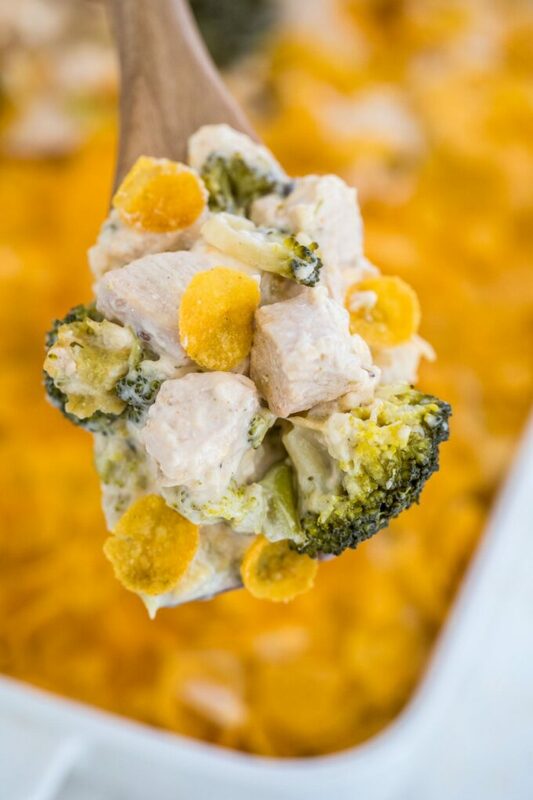 Chicken Divan is a creamy and cheesy casserole made from chicken, broccoli, and cheese. These three ingredients make for a flavorful, quick and hearty homemade dinner. Casseroles are relatively easy to prepare and are great to feed the whole family. You can also check out chicken cordon bleu casserole, corn casserole, and green bean casserole. Chicken Divan is a casserole made with chicken and broccoli in a creamy and delicious cheese sauce. It always reminds me of the classic homecooked meals that my mom prepared for the whole family when growing up. 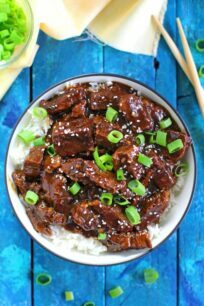 This is such an easy recipe to make with only a few simple ingredients, resulting in a full and hearty meal. With spring in full swing, you can find plenty of fresh broccoli in the store because they are in season. 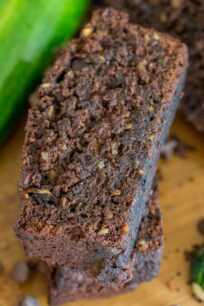 Also, it is the perfect veggie to use for this recipe, as it pairs very well with chicken and all the other ingredients. 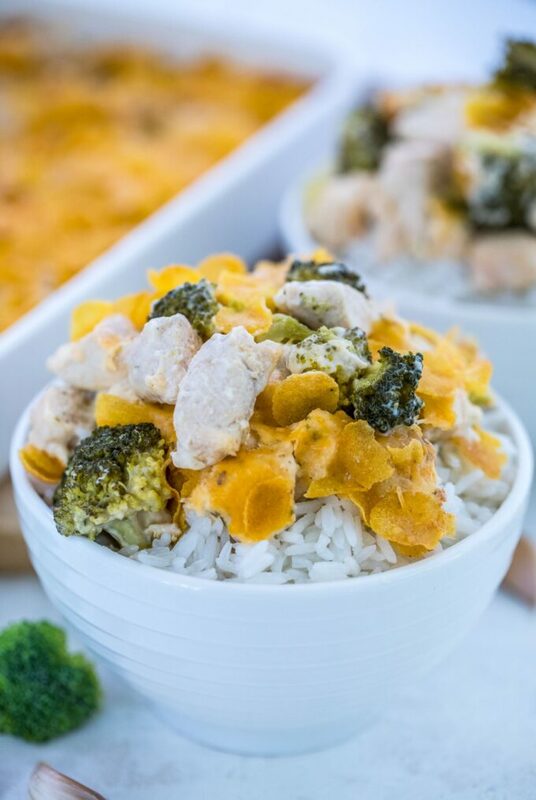 This recipe is one of our favorite ways to utilize chicken and broccoli together. 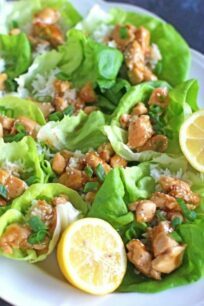 Apart from being irresistibly delicious, this meal is also quite healthy and full of protein and fiber. Once you will try it, you will be making it over and over! The original Chicken Divan recipe might have had either Mornay or hollandaise sauce. It was invented by a French chef and was named after the restaurant Divan Parisien in the New York Chatham Hotel where the contest was held. Many loved this casserole recipe and had been a household name since. What to serve with Chicken Divan? This casserole is a pretty full dinner in itself. However, sometimes we love to pair it with mashed potatoes, white rice, or noodles. How to make Chicken Divan casserole? Before starting anything, it is good to preheat the oven at 350 degrees to get it nice and ready so that we can just pop the casserole in after the preparation. Prepare your 9×13 pan by lightly spraying with nonstick cooking spray or some olive oil. 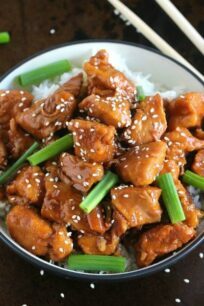 Prepare the chicken breast by cutting it into cubes and season it with salt, pepper, garlic powder, onion powder, and paprika. On a skillet, sauté the broccoli in olive oil for just 30 seconds. Add the broth and cover the pan. For two minutes, let the broccoli cook over medium to low heat. Afterward, transfer the broccoli to the baking pan and arrange it in one layer. Using the same skillet, melt the butter. Sear the chicken, cooking each side until golden brown without tossing. Once done, layer the meat over the broccoli. Mix milk, flour, and cornstarch in a measuring cup, and combine well. Using the same skillet, add in some extra olive oil, and sauté diced onion and garlic. Add the chicken broth and the milk mixture with additional seasonings. Stir well, and let the sauce simmer until it thickens. Remove from heat and mix in the cheeses until melted. Stir in the sour cream until it is incorporated well in the sauce. Pour this sauce evenly over the chicken and broccoli. Top with cheddar cheese and cornflakes in melted butter, then, cover the dish with foil and bake for half an hour. After the 30-minute mark, remove the foil and bake again for another 5 to 10 minutes to expose the toppings until golden. Let the casserole cool, and garnish with chopped parsley. Which vegetable is found in Chicken Divan? The popular answer is broccoli but feel free to experiment! Cauliflower, zucchini, and peas are similarly spring vegetables that can replace broccoli in this dish. They are all quite healthy and nutritious. Broccoli has many health benefits, vitamins, and fiber that are essential to our body. It has a lot of antioxidants that help with cell repair, slowing down aging, and preventing cancer. These are just a few of the many health benefits of this super vegetable. How to make Chicken Divan gluten-free? 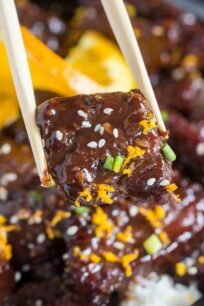 To make this dish gluten-free, substitute the flour for a gluten-free version like garbanzo bean flour. Also, in this recipe, we have avoided using breadcrumbs and used cornflakes instead. Can you make Chicken Divan Casserole in advance? Yes. We recommend to assemble the casserole first and leave out the toppings. Then, properly cover and freeze. Or, if you plan on cooking it in the next couple of days, just cover the dish properly and refrigerate. When ready, preheat the oven and let it cook for 30 minutes. 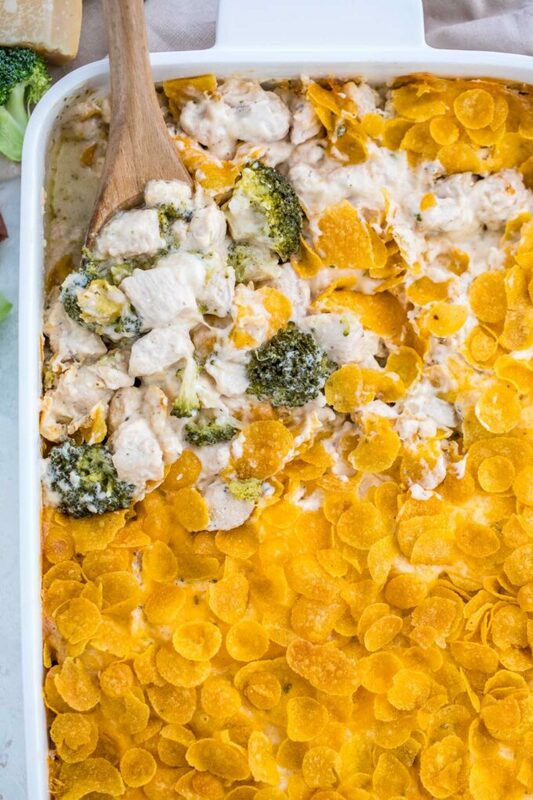 To freeze this casserole, simply let it cool completely. Cover it with plastic wrap and then, with aluminum foil. Frozen properly, you can keep this for up to 3 months. Plan ahead and thaw it the night before prior to cooking. Just, transfer it from the freezer to the refrigerator and let it thaw overnight. In reheating, you might want to toss in some milk or cream before baking again to introduce moisture. 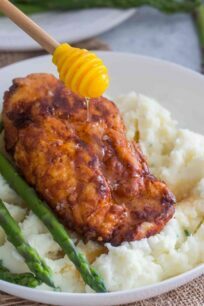 You may use chicken thighs instead of breasts for this recipe. Remember that the dish will still be baked, so when cooking both the chicken and broccoli, refrain from overcooking them. Lightly spray a 9x13 pan with nonstick cooking spray. Add chicken to a medium bowl and season with salt, pepper, garlic powder, onion powder, and paprika. Toss to combine and set aside. Add 2 tablespoons olive oil to a large skillet and heat over medium-high heat until hot. Add the broccoli and sauté for about 30 seconds. Add 1/2 cup chicken broth, cover pan, and lower heat to medium-low. Steam broccoli until tender but not limp, about 2 minutes. Transfer broccoli to the prepared baking pan and distribute evenly. To the same skillet, add 2 tablespoons of butter and melt over medium heat. Add chicken in one layer and sear for one minute without moving chicken then continue to cook and stir chicken until cooked through and golden. Add cooked chicken to the prepared pan on top of the broccoli, distribute evenly. In a measuring cup mix milk, flour and cornstarch until combined. To the same skillet, over medium heat add 2 tablespoons of olive oil. Once hot, add diced onion, stir and cook for 1 minute and add garlic. Sir and cook for another 30 seconds. Add the chicken broth, stir to combine. Add the milk mixture and stir to combine. Add the mustard powder, dried parsley, ground cumin, paprika, and black pepper. Stir to combine. Bring the mixture to a light boil and reduce heat to low. Simmer for about 5-6 minutes, until it thickens. Remove from heat and stir in cubed cream cheese and 1 cup cheddar cheese, until melted, next 1/2 Parmesan cheese until melted. Stir in sour cream until blended. Pour sauce over chicken and broccoli and spread into an even layer. Top with 1 cup cheddar cheese. In a small bowl, combine 1/4 cup melted butter with crushed corn flakes. Sprinkle over the top of the casserole. Cover dish with foil and bake for about 30 minutes. Remove foil and bake an additional 5-10 minutes until topping is golden and crunchy. 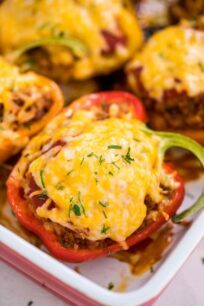 I love casseroles for their simplicity and they’ll feed the entire family, with possible leftovers! This is a great recipe that I look forward to making. 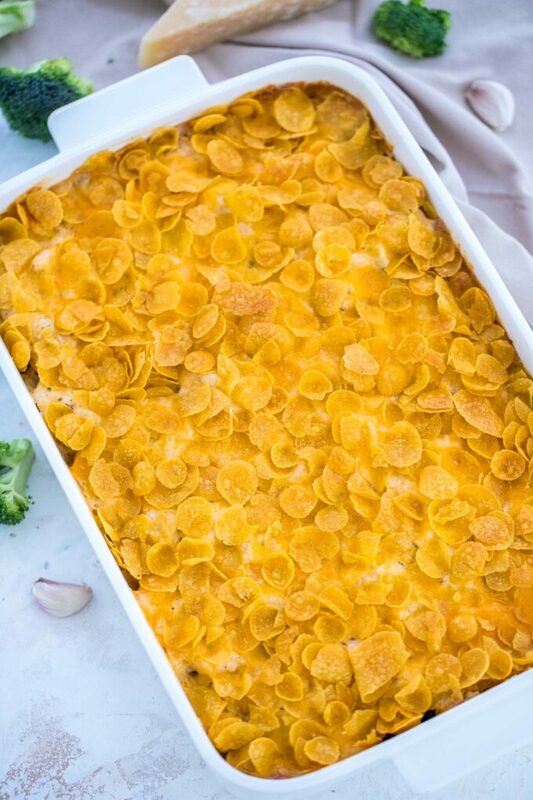 Three of my favorite ingredients in one casserole! I am greatly impressed with this recipe. I bet it’ll be a hit at our house! I love how yummy corn flakes are with savory pairings! 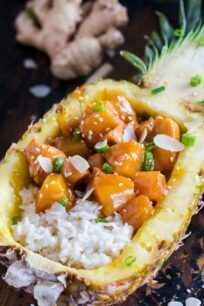 This dish looks really delicious!! Wow, your chicken divan looks so tasty! I’m going to have to try your recipe! I have had this at friend’s houses but I never knew what it was called. I have always enjoyed it so thanks for the recipe! This is the first time I’ve heard of this dish. 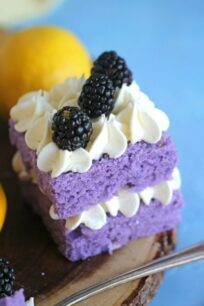 It looks interesting and delicious! I’ve never heard of chicken Divan but can’t wait to try it! My son will love it!